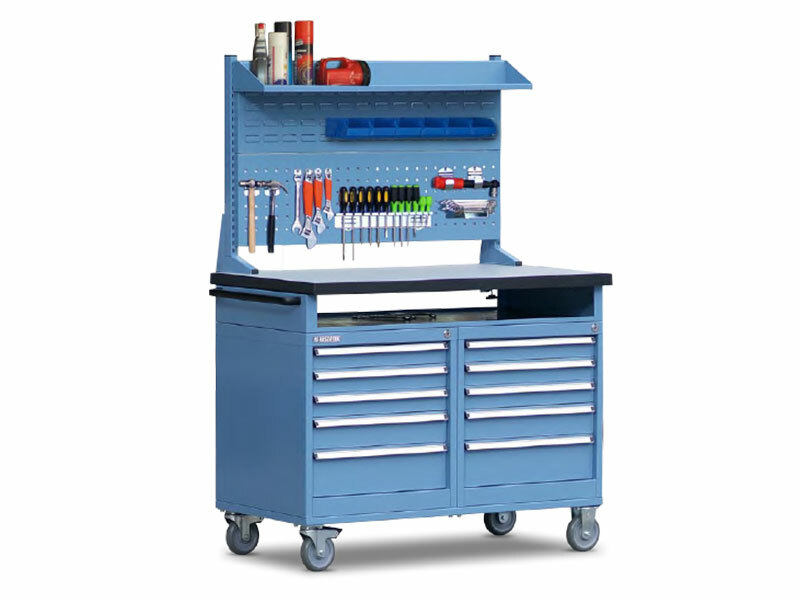 At Boscotek we understand tool storage and so have developed the Mobile Tool Cart Station. This feature packed, multi functional product, combines tool storage, small part storage and a durable work surface. It has the flexibility to be located anywhere in your workshop at any time. The rubber mat access compartment allows you to store tools or documents and keep them easily accessible. 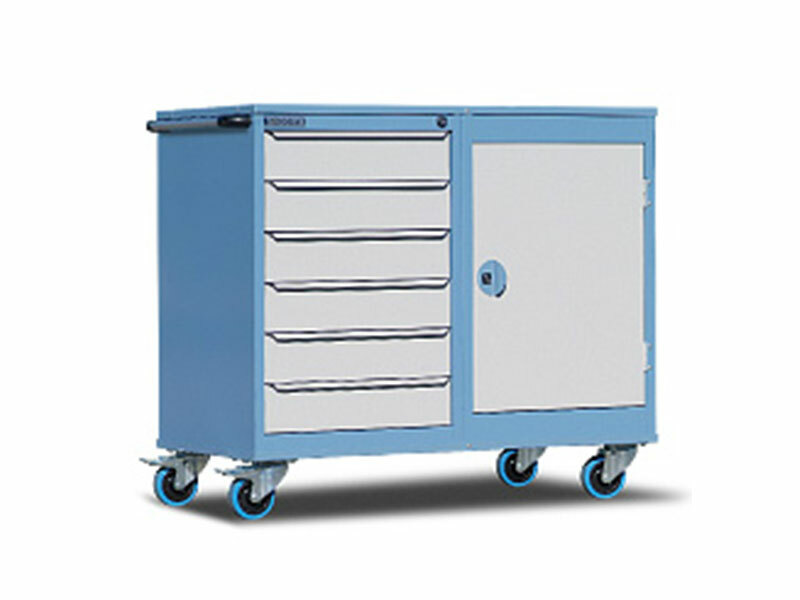 For bulky, larger items the tool cart can incorporate lockable cupboards and a shelf tray. The durable 40mm laminated HDF timber top can be used for mounting a vice or a general working surface. This is a mobile tool storage solution that is ready for almost anything. The Mobile Tool Cart Station comes with a 40mm thick compressed timber bench top with a 2mm laminated work surface with black edge banding. These durable and strong bench tops resist most acids and oil. The under side of the work surface is laminated to prevent moisture absorption, warping and shedding. Alternative bench tops are on the accessories page. Sturdy full length handle. Powder coated in textured black. Allows for easier manoeuvrability. Can be used to hang items. Hard wearing. Store tools and parts in this versatile 5 drawer storage unit. Ball bearing runners on all drawers with a 40 kg load capacity UDL. Top drawer includes 21 piece plastic bin set while additional drawers include steel dividers and partitions forming 9 individual compartments. All drawers with plastic lens label holder and are lockable. 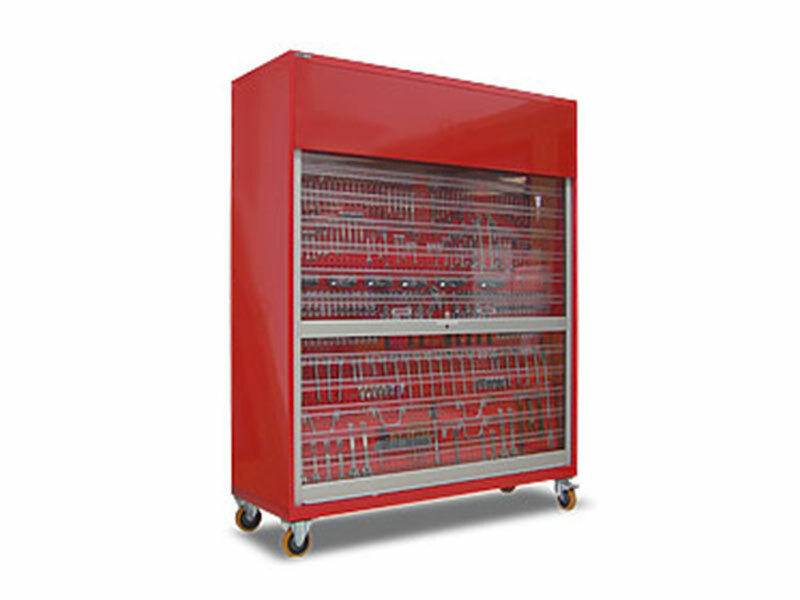 Configuration consists of 3 x 75mm drawers, 1 x 100mm drawer & 1 x 150mm drawer. Clamping 2 vertical mounting posts to the rear of the worksurafce a combination of tool and item storage accessories can be fitted. This allows tool hanging accessories to be used, standard plastic bins to be attached and items to be stored neatly and organised. 120mm high full width access compartment with rubber mat and front and rear lip to keep tools from rolling away. Quick access to frequently used parts. Large enough for A2 documents or plans. Containing one adjustable shelf to form two shelf levels. Key lockable full depth cupboard. Flush door with 110 degree opening. Door can be fitted to left or right opening by the user. 60kg shelf load capacity. Fitted with 2 swivel brake (with brake pedal) and 2 fixed polyurethane non-marking castors. Total Mobile Tool Cart Station load capacity is 400kg. This ensures level work surface with high load capacity and improved stability. Full width shelf tray allows miscellaneous items to be neatly stored. 25kg load capacity and 200mm depth. Keep tools and equipment organised and accessible with this 44 piece set including assorted size hooks, hangers and holders. Store almost anything from saws, spanners, screw drivers, allen keys, drill bits and drills. Manufactured from durable zinc plated steel with clip in design makes using and relocation simple. The centre hole allows secure mounting with nut & bolt (not included) for additional security during movement. 40mm solid hardwood oak timber oiled workbench top. 1.2mm 2B/304 stainless steel top over compressed 42mm compressed timber top with wet edge to contain liquids and rolling items. Store twice as many tools with the double 5 drawer unit configuration. (Code TCS.B26). This configuration suits storage of bulky, larger items with the 2 cupboard unit combination (Code TCS.B27).